People tell us the number one reservation they have about installing a saltwater aquarium is the cleaning and upkeep. Aqua FX Aquariums offers you worry-free enjoyment with our professional saltwater fish tank cleaning services. Our team of expert aquarists are among the most skilled and knowledgeable in the industry. Commercial aquarium maintenance caters to businesses and organizations who value quality service and want their aquariums properly cared for. Our flexible scheduling takes in consideration your hours of business, the needs of your clients and other factors to provide you excellent service. We will create a customized plan that will ensure your saltwater fish tank is always healthy and looking the best it can. Our technicians are as discreet as possible ensuring that your customers and clients are not disturbed, and that your marine or reef aquarium always looks its best for your visitors. Your aquarium will be a conversation piece for everyone that comes into your office. Contact us today to bring some relaxation to your office or waiting area. Residential aquarium maintenance accounts make up about 50% of our customers. We we know that your schedule is hectic and that when you arrive home at the end of the day you just want to relax. Aqua FX Aquariums values your time and works with your schedule to provide you as much time as possible to enjoy a clean aquarium. If worrying about keeping a saltwater fish tank clean is holding you back from discovering the joy of a custom aquarium. Let us worry about maintaining it and leave the enjoyment to you and your family. We design a maintenance program to fit the specific needs of each client. With weekly, biweekly, or monthly service we insure your saltwater fish tank and its inhabitants receive the care they need and deserve. You don’t have to worry about saltwater fish tank cleaning, ordering food and supplies, maintaining critical levels like salinity and PH or other time consuming and sometimes complex procedures with our maintenance service. Our vans are equipped with all of the necessary tools and supplies needed including additives, foods, tools, test-kits, and even livestock right to your doorstep at no additional charge. We don’t just clean your tank, we maintain it. There is a difference. Contact us to discover how Aqua FX Aquariums can create and maintain a piece of “living art” in your home or office. When you’re choosing a company to install or clean your aquarium it can be hard to differentiate between companies. To be honest, it’s doesn’t take much for an aquarium hobbyist to start a single-person tank cleaning business out of their home. What separates our aquarium management firm from a one-person operation? Read on to find out. Experience – we employ a staff of trained aquarists with decades of experience that service hundreds of appointments every month. There isn’t much if anything we haven’t seen during our years of service. This provides you with a level of care unsurpassed in the industry. 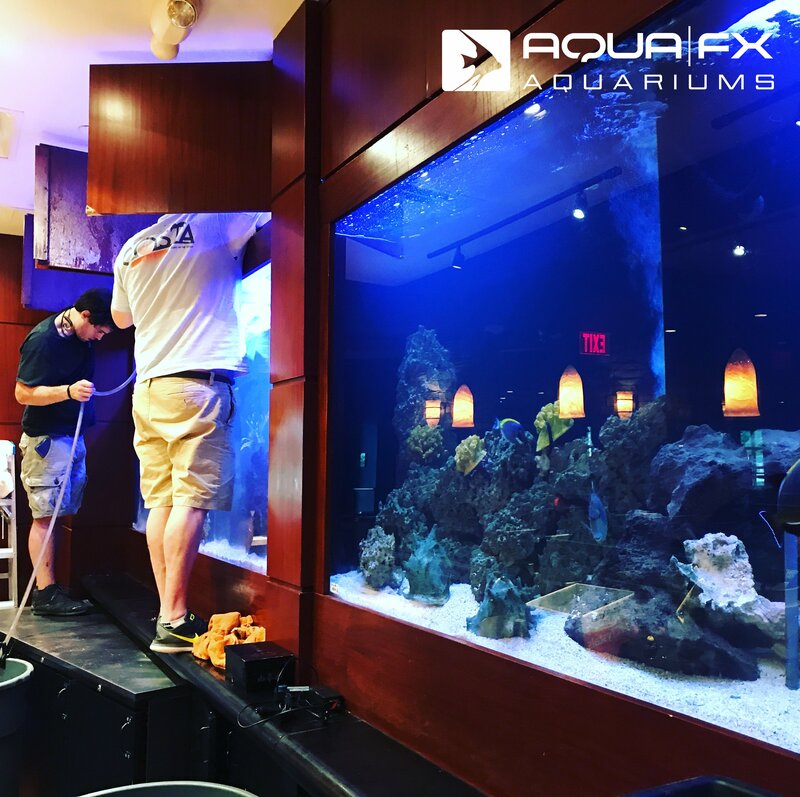 From an optimized tank cleaning process to early diagnosis of any signs of trouble, all of our efforts are concentrated on keeping your aquarium as healthy as possible and making sure all your needs as a client are met. Professionalism – being Michigan’s premier aquarium service provider means the privilege of premier clients. We deal with with professional athletes, celebrities and high-net-worth individuals all the time. Whether dealing with personal assistants, estate managers or signing confidentiality agreements, we’ve done it all and handle VIP clientele with the professionalism you’ve come to expect. The commercial arena is no different. We pride ourselves on efficiency and professional courtesy when dealing with some of the largest businesses in Michigan. Our Company – Aquarium sales and service is our business, not a sideline. Because we don’t operate a retail store, we can offer a greater variety of services to our clients. We offer a complete line of aquarium products delivered right to our customers. As well as quarantined livestock from around the globe. 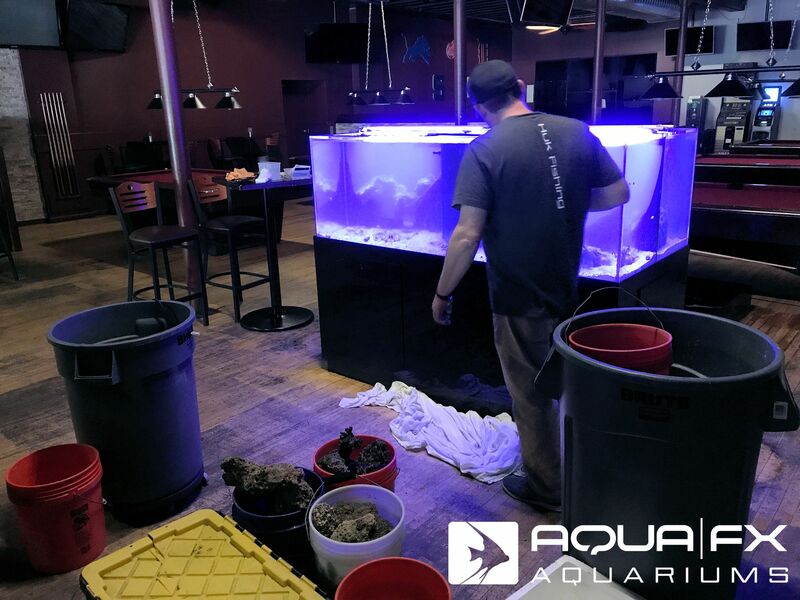 Our large, professional staff of aquarium technicians allows us to run multiple routes covering a large service area; from Port Huron to Lapeer and Commerce Township to Ferndale, we service a 50 mile radius from our warehouse in Shelby Township every month. Aqua FX Aquariums is dedicated to providing the highest quality aquariums and aquarium services available. We are fully insured with decades of experience and a client resume that we’re very proud of. When you invite a service contractor into your home or business you should be able to trust in that company’s ability to perform at the pinnacle of service and professionalism. Our goal is to exceed your expectations.